Party Magic will entertain you! Keith Downs is a professional magician. who lives in Deeping St. James, Peterborough. He is a most accomplished magical performer and also amazing at balloon modelling. He is a member of Equity as well as a member of The Magic Circle. His interest in magic began at the age of seven when he was given a conjuring set for his birthday. During his mid teens he began performing at children's parties and developing his skills at close-up magic. After twenty seven years of teaching Keith decided to turn his hobby into a business. He left the classroom in 1998 and started Party Magic. Party Magic is suitable for the smallest party in the smallest house to school halls and fetes, birthdays, wedding receptions....in fact wherever there are children let there be Magic! He entertains children of all ages from nursery groups to teenagers. When performing for children Keith has different shows for different ages. For the youngest audiences Keith is assisted by a variety of glove puppets. These clever assistants perform hilarious tricks ideally suited for this age group. There are different shows for other age groups and shows suitable for a mixed age range. For ten year olds and above Keith will perform adult style magic and also run balloon modelling workshops. 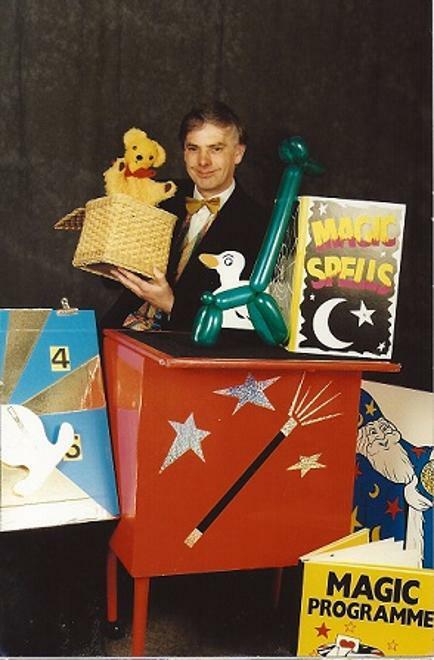 All of his performances include story magic, balloon modelling, magical give-aways and plenty of audience participation. He entertains adults with close-up magic either strolling or at tables. Thank you very much for providing us with wonderful entertainment and magic yesterday. You helped to make Katryn's birthday a special and enjoyable day. We wish you every happiness and success for the future. We wanted to drop you a line to say a huge thank you for doing the magic and entertaining at Megan's birthday party last Saturday. All the children had a wonderful time and Megan in particular said how much she enjoyed it, especially because you did the "Barbie trick"!!!. You have such a natural and fun rapport with the children, I've never seen them so attentive. Also an extra thanks for the dance games you so generously supervised whilst we were waiting for the food! We shall definitely be using your services again on the near future and look forward to meeting you again very soon. We wanted to write to let you know how pleased we were with the 'Magic' party you did for our daughter Jessica today. We felt we had more than our money's worth and more importantly, all the children (and grown ups) loved the show! Many people commented on how good you were and also friendly. Jessica and Matthew have been talking about you non-stop and think you are very funny! They have also been practicing their magic tricks. We shall certainly be recommending you!